Happy Friday, everyone! To celebrate, here's an easy tutorial just perfect for some fun weekend sewing. Let's have a Spool Party this week! 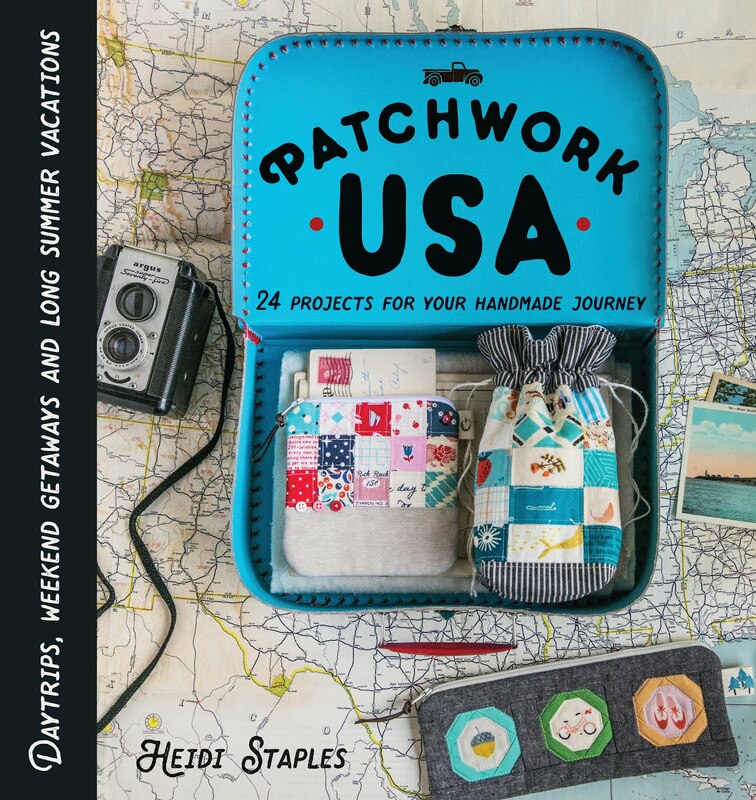 If you make one of these pincushions -- or even a bigger project with this spool block -- share a photo on Instagram along with the hashtag #spoolparty and make sure you tag me too @fabricmutt. I think this pattern is especially fun for fussy cutting, and I'm hoping to make a pillow with lots of cute spool centers! Notes: All seams are 1/4". Press seams open or toward the darker fabric. 1. 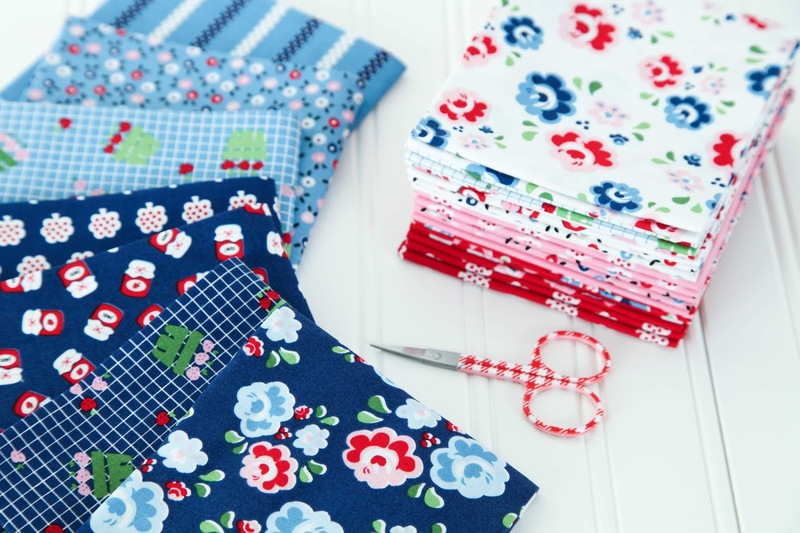 Sew a 3/4" x 2 1/2" background strip to the right and left edges of a 2 1/2" x 2 1/2" feature square. 2. Sew a 1" x 3" spool end strip to the upper and lower edges of the block. This is a finished spool block which you can use to make pouches, table runners, quilts, etc. 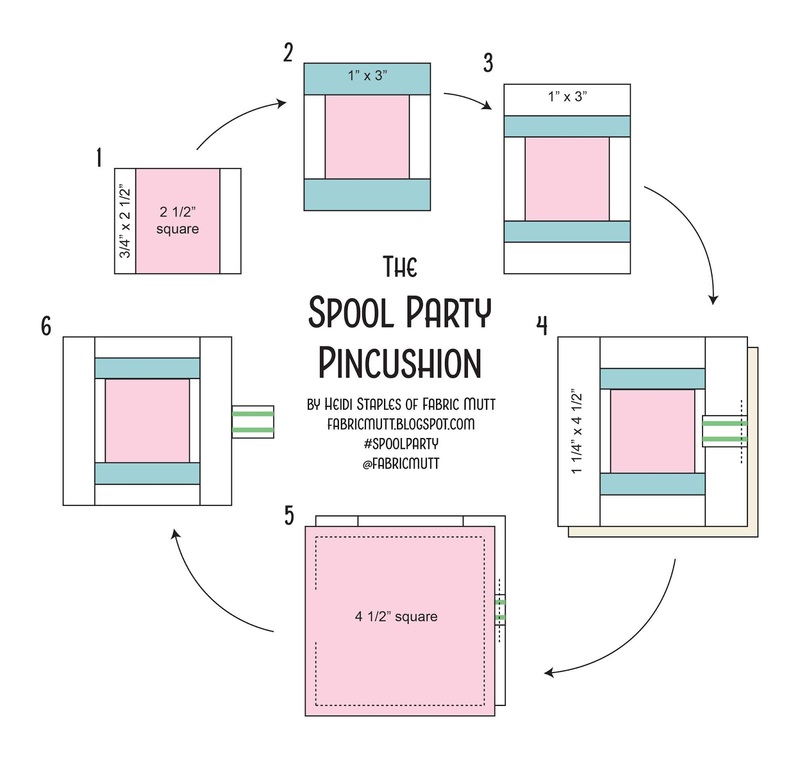 But if you want to make the Spool Party Pincushion, keep going! 3. 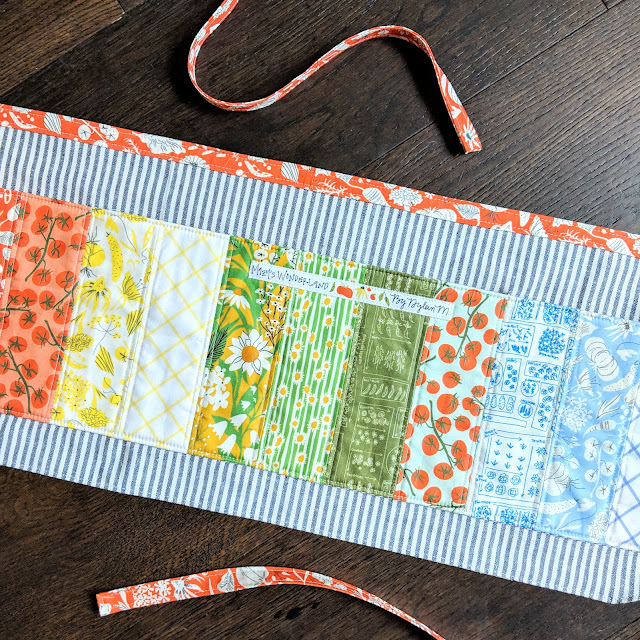 Sew a 1" x 3" background strip to the upper and lower edges of the block. 4. Sew a 1 1/4" x 4 1/2" strip to the right and left edges of the block. Use adhesive basting spray to fuse a 4 1/2" x 4 1/2" piece of batting to the wrong side of the block and quilt as desired. Fold a 2" piece of twill tape in half with wrong sides together and center it on the left edge of the pincushion top. Baste it in place. 5. 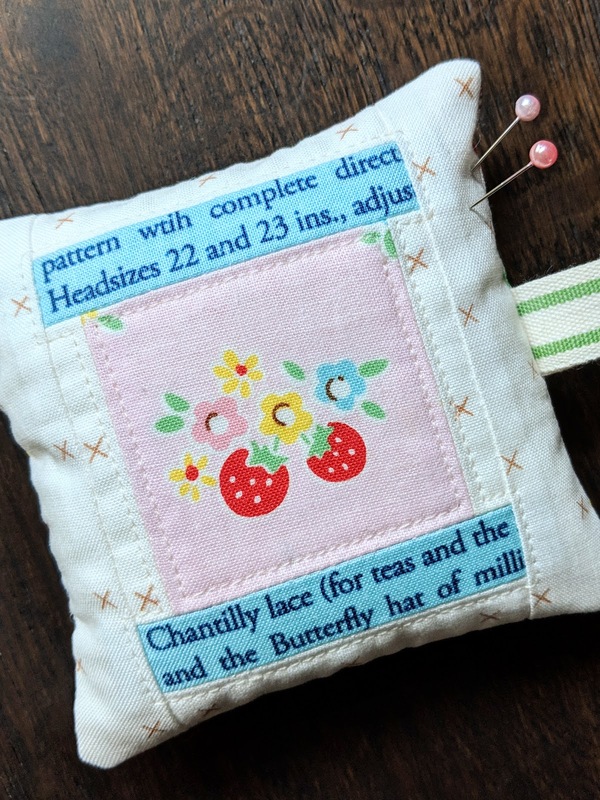 Place a 4 1/2" x 4 1/2" piece of backing fabric right sides together with the pincushion top. Sew all around the outside edge, leaving a 2" gap on the side opposite the twill tape loop. Trim the corners and turn the pincushion right side out. 6. 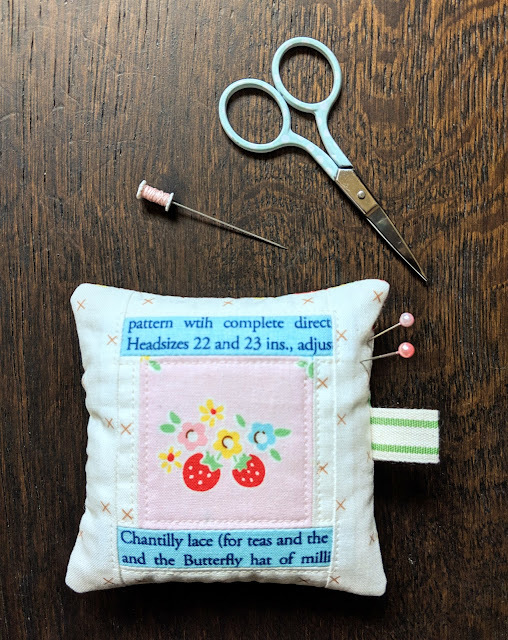 Stuff the pincushion with the stuffing of your choice and hand sew the opening closed. 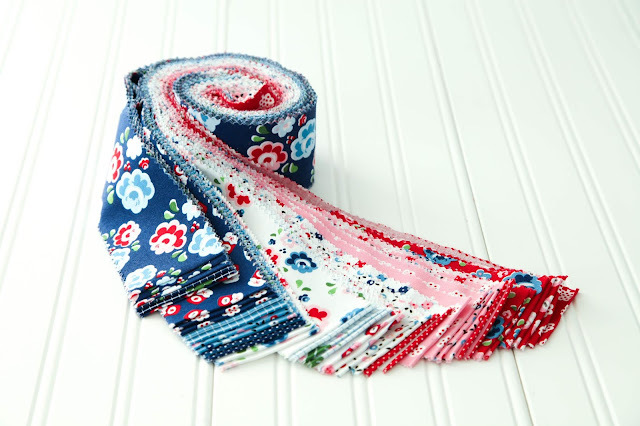 I can't wait to see lots of cute spool projects showing up in my feed. Be sure to share this tutorial with friends so we can get this #spoolparty started! It will be four years in June since my family made our big move from Southern California to the Texas hill country, and I'll never forget that first summer in our new home. Those early months were a roller coaster of emotions as we tried to unpack and settle in while our house was still being repaired and renovated. 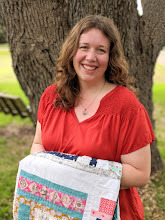 We didn't know a soul in Texas, and though people were kind, it was challenging to start the journey of finding a place for ourselves in this new community. In many ways, it bonded us together as a family like nothing else could have done. We spent that first summer enjoying one adventure after another, exploring nearby museums and attractions, driving to downtown San Antonio and small town Fredericksburg, and eating some of the best food I've ever tasted in my life. Dad and James taught the girls to swim, and we spent nearly every afternoon playing in the pool until dinner time. James planted a tiny orchard as well as a garden for vegetables, fruits, and herbs in the backyard, where our girls loved to help him water, pull weeds, and check on seedlings. And Mom and I slowly began to turn our rambling house into a home, one unpacked box at a time. That first summer in Texas has been followed by two more, and even now I'm eagerly looking forward to the next one. Nowadays summer means going on long road trips and short daytrips, working on patchwork in the loft while the girls read in their library, volunteering with our church's Vacation Bible School, taking walks along the horse trail before the sun goes down, watching fireworks with all the other families in front of the local high school on Fourth of July, and looking out the kitchen window to see James and the girls coming in from the garden with freshly picked cherry tomatoes, strawberries, and watermelons. It means movie nights in the family room laughing over classic comedies from the 1940's, quiet mornings doing puzzles in the breakfast nook, and barbecue dinners that start with tall glasses of iced tea and end with warm shortcake smothered in strawberries and whipped cream. 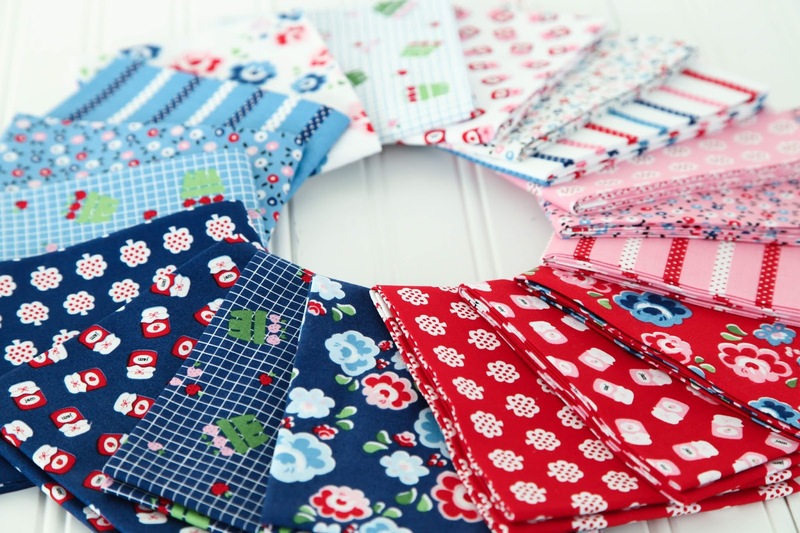 My Shortcake collection is a celebration of all those beautiful summer moments that I treasure in my heart. 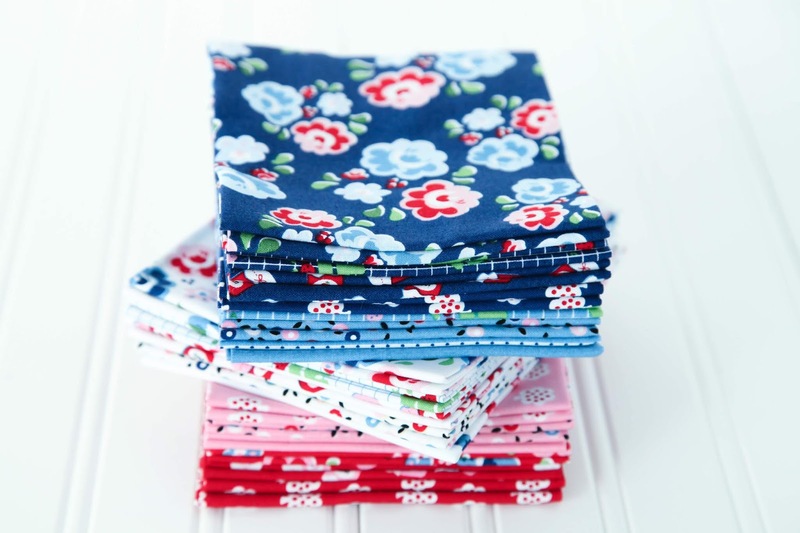 And I'm so happy to share these fabrics with you so that you can use them to make memories of your own. So many thanks for all the lovely comments on my last project, both here and on Instagram! I had no idea that Liberty spool runner would be such a hit. 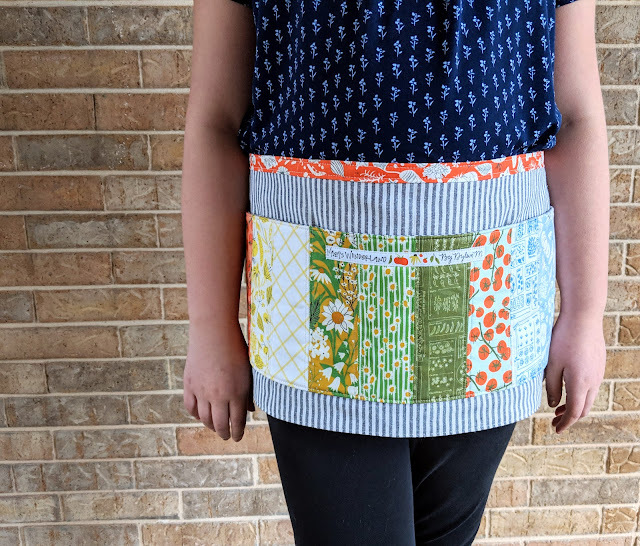 I've received so many requests for the pattern that I'm adding it to my to-do list. Keep an eye on the blog for more news to come on that! 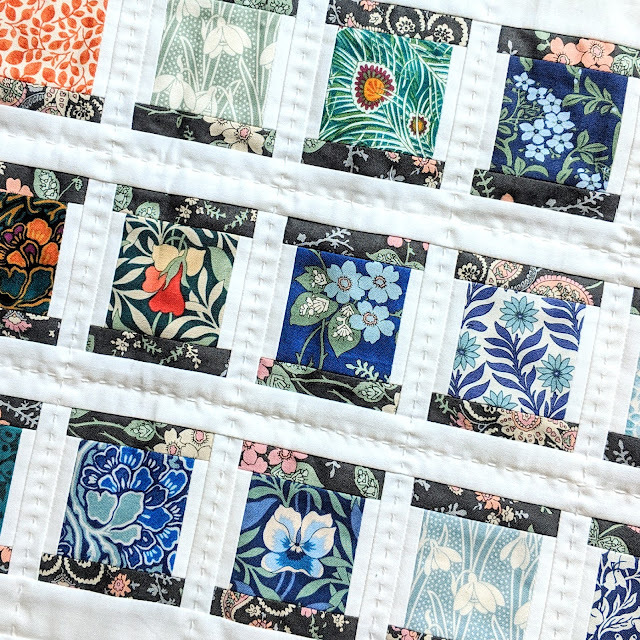 My dear friend Christopher (aka The Tattooed Quilter) has released a beautiful new basic print for Riley Blake Designs this year called Blossom, featuring the tiniest flowers tossed over a solid background in a rainbow of colors. 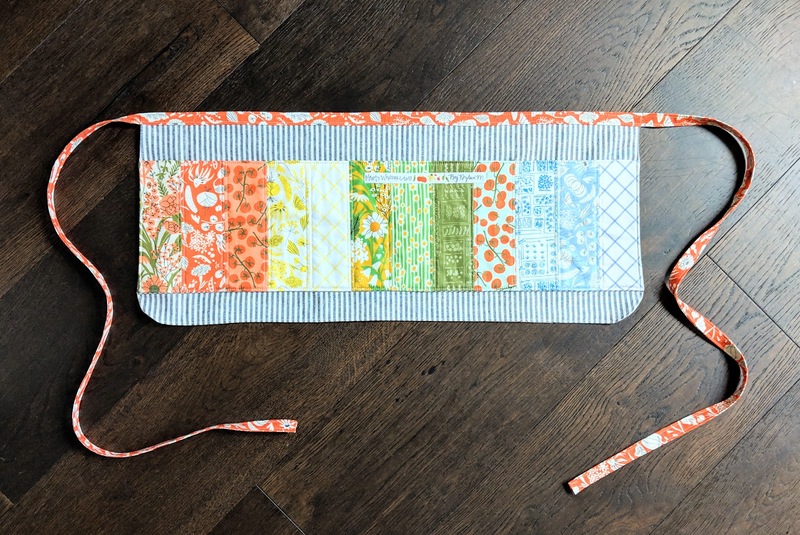 I adore the small scale of this print, making it so perfect for little patchwork projects like the one I'm sharing today. 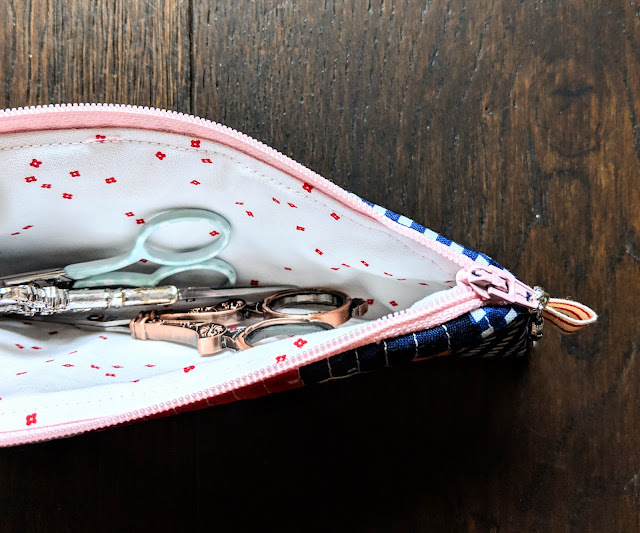 I'm a big fan of embroidery scissors, and I love collecting new pairs whenever I get the chance. This, of course, means that I also get the fun of making a pouch to hold them all, which is what I did last week. 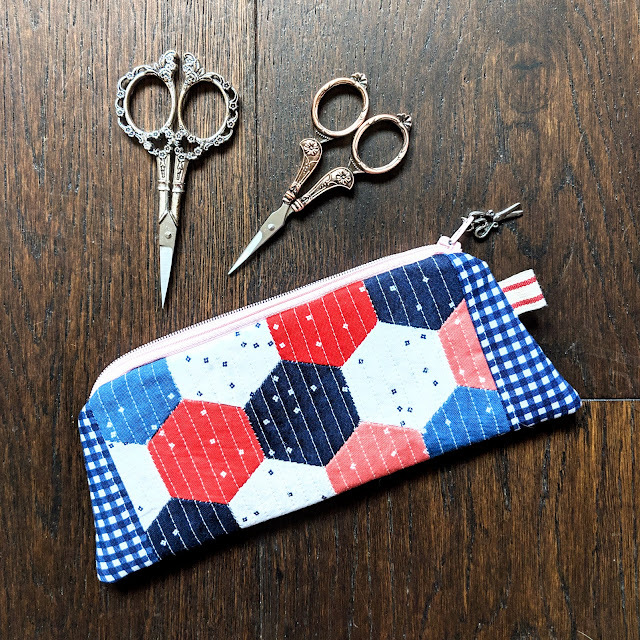 This hexagon zipper case is a variation on a pouch from the book Sweet & Simple Patchwork Gifts by Hisako Arai and Yoko Sanjo, which I highly recommend if you love small patchwork projects the way I do. I changed things up a bit so that there are only hexagons on the front and so that I could finish the pouch by machine instead of by hand. 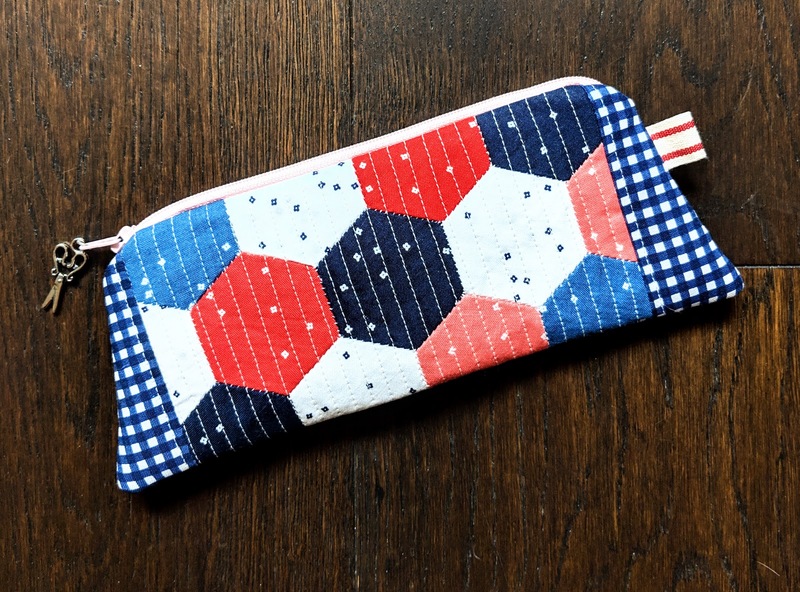 My red, blue, white, and pink hexagons are bordered by navy gingham for a spin on patriotic colors, which is currently one of my favorite color schemes. 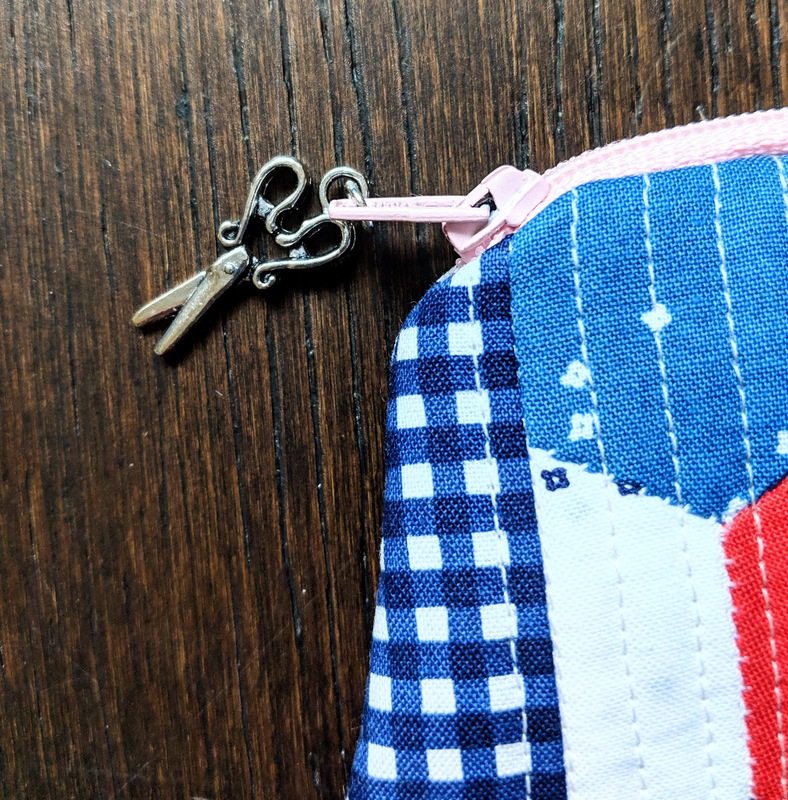 I added a pink zipper, a red and cream twill tape loop, and an adorable scissors charm to the zipper pull. The pouch is lined in a white Blossom print featuring little red flowers, and I love the way it looks against that pale pink zipper. This charm makes me so ridiculously happy every time I see it!